There was drama over the weekend in Kayole, Nairobi when a man attempted to commit suicide but his plans were thwarted by residents and Kenya Power. 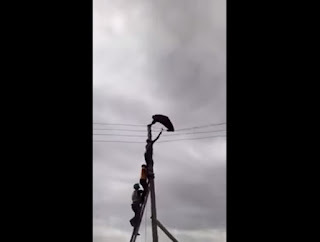 The depressed man had climbed atop an electricity pole and was dangling by the electricity lines when residents risked their lives to save him from himself. Luckily, the Kenya power had cut power supply from the area and were informed of the man attempts. According to the residents, the man was later given a dog's beating, a common way of disciplining a man who attempts to take away his life. Why beat him? He needs mental help not physical assault!!! !